Standard - $56.99 X-Large - $56.99 Only 9 left! 2017 gave us a whole new King Kong movie to love and adore with the feature film Kong Skull Island hitting the theaters. We couldn't get enough of the action from this brand new Monsterverse flick, and if you feel the same way, well, then there's only one thing to do. You gotta be Kong this Halloween! You won't have to travel through a perpetual storm to get yourself a Kong costume, all you'll have to do is order it from us. And you won't need a elaborate getup to emulate the large and in-charge character either. Officially licensed, with this deluxe King Kong costume you'll have a quick and easy go-to style that will let you rule the party. You'll feel so powerful in this costume, that you could probably take on skull-crawlers or even a unit of military helicopters! But we think your party adventures will be much more chill in this cool costume. 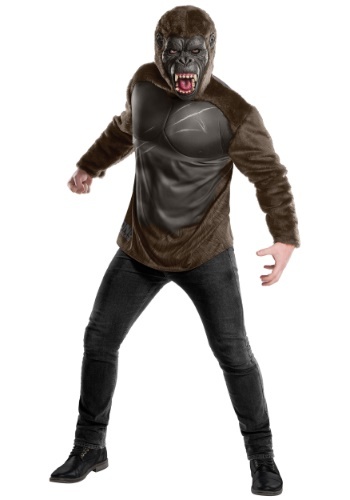 The costume top features faux fur shoulders and sleeves, and padded pectoral muscle effects let you do your best King Kong impression. The lower part of the shirt is printed polyester to continue the costume effect, including a movie logo. Complete the costume with the latex and faux fur mask, and you're going to be fearsome!